Every January, Freshmen, Sophomores and Juniors were able to see their goal: To be a senior in my German or French class and write their post-graduation plans on the poster in front of the room for all to see. In order to do that, of course, they had to be enrolled in my class as a senior. This message was subtle, but it worked. I started displaying this special poster every January several years ago. It is a simple thing to do. It seems insignificant, but the impact was huge. 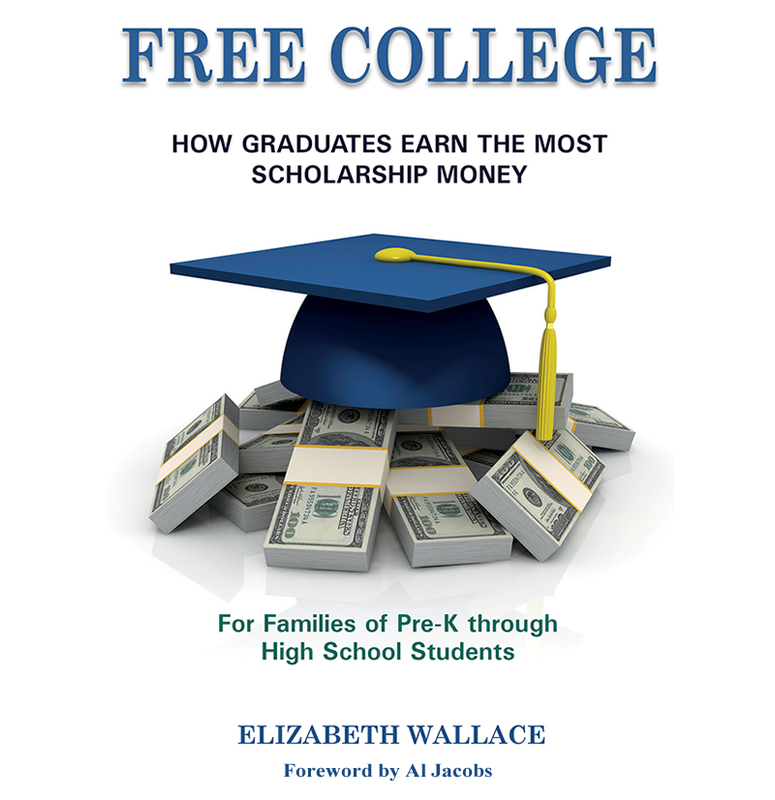 My goal was to encourage students to go to college. At first, only a few had such plans. After a few years, there was a shift. The last thirty years of my teaching career, all of my seniors went to college. But there was a secondary benefit that I did not expect. 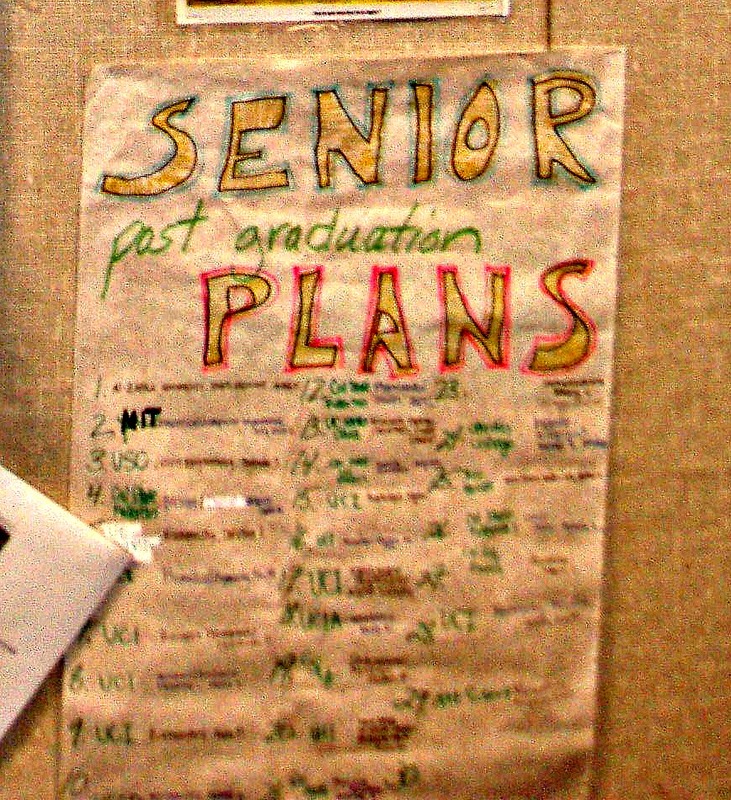 Often I heard underclassmen saying, “I can’t wait until it's my turn.” They knew they had to be enrolled in my French or German class as a senior in order to put their names and post-graduation college plans on the poster. This helped my advanced classes grow in size. Supplies Needed: One large white poster. If this is not available on campus, go to Smart and Final or some other restaurant supply store and buy yourself a roll of white butcher paper. It is much less expensive, and has many uses. Two fine, felt tipped pens of two different colors. I used black and blue, but any two dark contrasting colors will do. Two wide, felt tipped pens of two different colors. Pick colors that are bright, cheerful and easy to read from a distance. Procedure: 1. 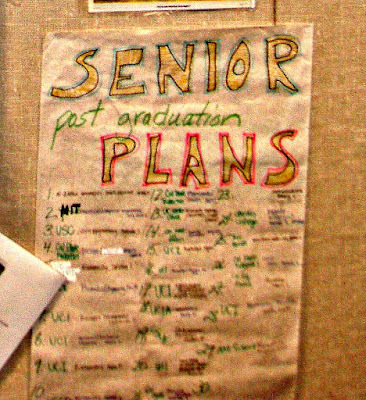 Using the wide pens put the title SENIOR Post-Graduation PLANS on the top of the poster. 2. Create two columns on the poster, numbering one through the total number of seniors you have enrolled in all your classes combined. 3. Ask seniors to tell you when they have decided which college they are going to attend, and have been notified of their acceptance. 4. Once they know where they are going, have them put their first name and last initial next to a number, the name of the college or university, and what they are going to study. If their major is undecided, they write “undecided”. Be sure to hand them the fine, felt tipped pen you want them to use, alternating colors to make it easier to read. Remind them to write bold, like John Hancock. You will have to stay on top of them, until this becomes a tradition in your program. Once it becomes the thing to do, they will remind you. This annual event helped create a positive vibe in class. Students were proud to display the fact that they reached their goals. This instilled the desire to take part in the underclass students in lower levels of French or German. As a side benefit, administration liked it as well. It’s easy. It’s fun. It encourages students to stay in German or French until they graduate and to go to college. All good.